Got mine today 5th February. Mostly from farming charms in Halls of Lightning (Scorie) Took a fair few hours to farm it. The easiest way to farm it is to go in Deepholm and kill Chauve-souris de pierre and http://www.wowhead.com/npc=42524. Here's the macro you can use to track how many Breloque ravissante you still need to farm for your mount. Change the number 270 to whatever your goal is if you want to buy pets + whatever. The Inséparable rapide is purchased for 270 x Gage d'amour. It is NOT Bind on Pickup, which means you can purchase one for yourself, or for resale. In fact, using the strategy below, you can grind enough to acquire several Inséparable rapides to sell, which may be especially profitable for resale after the Valentine's Day events are over. You can collect a Gage d'amour by trading in one Bracelet de breloques ravissantes at the Marchande ravissante vendor in any major city. The Bracelet de breloques ravissantes is created by turning in Breloque ravissante x10. You can get Breloque ravissante by killing mobs appropriate to your level while you have a Trousse de collectionneur de breloques ravissantes in your inventory, which you also receive by talking to the Marchande ravissante. Can confirm Throne of the Tides as a brilliant place for farming Breloque ravissante. Took me about 1 hour and a half to get 1000 Breloque ravissante as a prot pally at the throne of tides killing the smaller water elements. Just sat in the puddle in the room at where they spawn 1 Marteau du vertueux and killed them all worked wonders way faster then slags. Also used the seal to keep my health up from the dots you get when they die. You need Trousse de collectionneur de breloques ravissantes to collect Charms. I probably farmed like 1.5k Lovely Charms today... (heh, I know, right? What is sleep?) I made so many of them, just to exchange the bracelets directly for tokens. The reason I had to do it this way was because I hadn't had time to finish the dailies on every day of the event, and I was focused on getting the Robe noire ravissante too, which took several tries (at 20 Love Tokens a try...ouch!) but thankfully I got lucky on that one, too. Since I was going solo (I didn't have anyone to run me) I took a shortcut to get to the Lyceum in BRD for charm farming. I discovered it completely by accident, but I don't think it would be easy (or even possible) for a class without a bubble or heals to pull this off, unless maybe you can get massively stacked on fire resistance gear. Use the mole machine to get to "outside the Grim Guzzler," and then jump off the platform so you fall past Seigneur Incendius and into the lava pit below. You'll probably land on a rock which will damage you really badly from the fall, so heal up before proceeding. Swim into the lava and head north, and watch out for the Fireguard elementals in there. Bubble shields can absorb the lava burn damage, and you can sometimes jump in and out of the lava to avoid the burn effect, but not always. (glitch maybe?) Be ready to heal/bubble at all times when swimming, and take shelter on a rock ledge if you need to mana up or rest. There'll be a place called the Molten Bridge not too far upstream...climb out where it lets you, and watch out for the 3 Fireguards on it (fight them if you have to,) and go straight up the big ramp (where the quest NPC is) and turn right, and open the big double doors. That's the Lyceum room where I was farming the Reservists. Just thought I'd share this info! As of 2/12/2014 Corruption instable within Trône des marées will no longer grant you Breloque ravissante! For the love of all things (no pun intended) don't forget to get a Trousse de collectionneur de breloques ravissantes prior to starting this farm! You will need to clear your way to Ouk-Ouk by killing the two Bagarreur hozen abruti par l’alcool and the three Bagarreur hozen enflammé. Note that these Bagarreur hozen enflammé can inflict Illusion embrasée which may be troublesome for casters. You will have to kill a total of 40 Hozen before Ouk-Ouk will spawn. Use Tonneau qui roule which will deal Explosion de bière to whatever you crash into, thus significantly speeding up this process. Once Ouk-Ouk spawns go ham on him. Watch out for his frontal Sol martelé which is avoidable by simple moving out from the front of him. He also stacks Banane enragée so down him as quickly as possible. After downing Ouk-Ouk proceed to the stairs where you will find Sautillon, Cognedur and occassionally a Sautilleur. You can stand at the base of the steps (the area right out side of Ouk-Ouk's crashed party and farm them. Countless Breloque ravissante from these little guys and they are easy to down. Should you hapen to get overwhelmed with Sautillon's and Cognedur's just Taper ! them by using a Bon vieux marteau to send them flying to the heavens. However doing this will not grant any Breloque ravissante. If you engage Sautallus this will cease the endless spawn of Sautillon and Cognedur. Be prepared for a hefty repair bill. Roughly 1% armor degradation per minute farming here. Jeeves would be handy, but nonetheless you can head to town to repair and convert Breloque ravissante to Bracelet de breloques ravissantes and turn them in for Gage d'amour which stack up to 250. Downing Ouk-Ouk will not save you to this instance. Should you happen to zone out, use your Pierre de foyer or log out you will have to restart the entire process from scratch! I am currently able to solo and farm this on my 90 Rogue using Éventail de couteaux and Tempête cramoisie while keeping up via . Don't forget to do the Daily Quests as they will each grant you with 5xGage d'amour which equate to 50xBreloque ravissante. You can earn a total of 30xGage d'amour a day which = 300xBreloque ravissante! 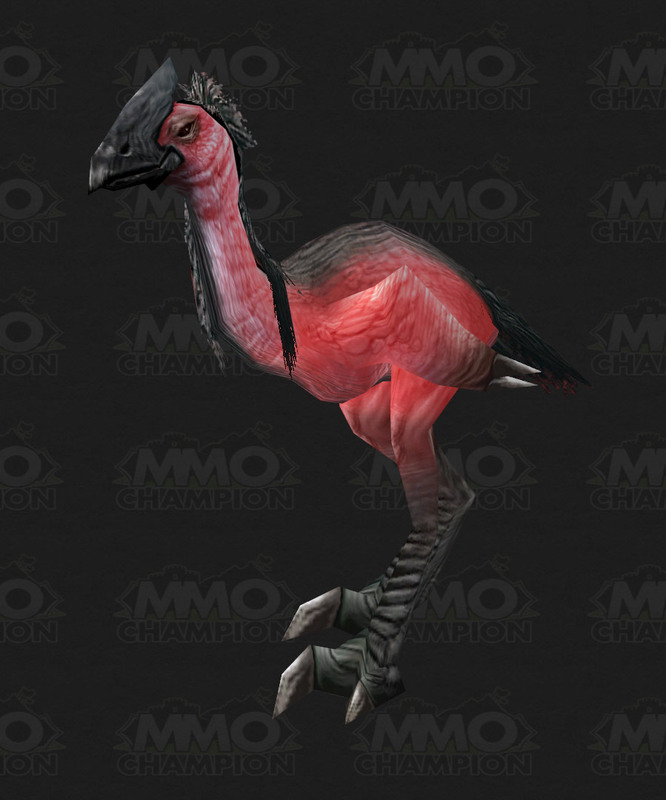 New in 2015, you can obtain a Oisillon inséparable, which is a Battle Pet version of the Inséparable rapide mount. This battle pet is available during the Love is in the Air by purchasing Oisillon inséparable for 40 Gage d'amour from Marchande ravissante. TL;DR: You need 2700Breloque ravissante to buy this. Happy Farming! Best farm spot for Breloque ravissante I have found is in Heroic mode Scarlet Monestary. Zone in, aggro all 6 Pile of Corpses, run to the door, and AoE everything down. The piles will continuously spawn more Zombified Corpses. They only have about 5.5k health, so easy to let them pile up and AoE em down. Plus, it's instanced, so no fighting others for the spot (yes you can zone in without being in a group!) As a Boomkin, I have collected about 1400 Breloque ravissantes in about 1 hour. Happy Farming! "On dirait du rouge, mais pas tout à fait."